Similar to the ongoing crises in Iraq and Syria, the conflict in Yemen has effectively devolved into a proxy war between Saudi Arabia and Iran. Although the theater in Syria is complicated and multifaceted, the civil war in Yemen has a relative polarity. However, the seeming simplicity of the sectarian breakdown between Shi’ite and Sunni combatants belies the external pressures that influence the ongoing strife throughout Yemen. In terms of open martial antagonism, the combatants are broadly aligned along sectarian parameters, with even the local al-Qaeda insurgents gaining a reputation for alliances of convenience with the Saudi military. The tribal-based Houthi movement, Ansar Allah (Partisans of God), has been receiving its own external assistance. The Houthi rebels, who practice the Zaidi sect of Islam (a subsection of Shi’ism that is similar to Sunnism in many respects), have received assistance from Iran’s Quds force, which has also played a major role in backing the Assad regime in Syria, a host of Shi’ite militias in Iraq, and Hezbollah in Lebanon. This leaves a sort of Sunni-Shi’ite axis along which most of the fighting breaks down, and an ongoing catalyst for armed escalation throughout the region. In this framework, many of the ongoing tensions are defined by each party’s either covert or explicit allegiance to the power players in Tehran or Riyadh. What ensues between Saudi Arabia and Iran is a prolonged power struggle that is neither a direct engagement nor a sort of cold war, but one that rests within some tenuous middle ground of ongoing proxy war maneuvering. Riyadh and Tehran’s geopolitical relationship is a classic example of two powers vying for whatever upper hand can be found irrespective of auxiliary factors. Questions around military escalation in foreign countries are only relevant if they are too taxing for either Saudi Arabia or Iran (damage to local civilian populations or infrastructure is a tertiary consideration at best). One of the primary factors that makes this pattern of engagement so easy for both parties is that potential allies and antagonists can be divided neatly along sectarian lines. Saudi Arabia has found it easy to ally with Sunni insurgents, while Iran has found amenable Shi’ite partisans in Hezbollah and the Syrian Alawites. Saudi Arabia occupies a relatively privileged geographic position in the Middle East, insofar as Daesh (“Islamic State”) is much more menacing to the Syrian and Iraqi governments. There has been relatively little attack from Daesh along the Saudi border as the group seizes territory previously under regime control. Thus curtailing the group has remained a lesser priority for the House of Saud. There has been longstanding speculation that sources within Saudi Arabia have been backing and supporting Daesh through various covert means, in part because their belligerence in Syria and Iraq has whiplashed against the Iranian-backed regimes in Damascus and Baghdad. One of the longstanding and most withering criticisms of Saudi foreign policy is that Riyadh has made a habit of exporting Wahhabism and jihadi extremism as a political weapon, which has spilled into lands as far away as Chechnya and Indonesia. This has insured the dual leverage of friendly elements (or militias) in outside states, as well as a sort of counter-pressure against potentially unfriendly governments. Iran’s gambit in Yemen seems to represent a sort of counter to this. Yemen’s strategic value to foreign policy decision makers in Tehran lies in Iran’s ability to bring the conflict, in a very real sense, into Saudi Arabia’s backyard. They have much to gain, and very little to lose, by exacerbating the conflict that festers south of the Saudi border. The kingdom has remained wary of serious commitment of ground forces, and their airstrikes appear to be coordinated so as to in part benefit the local al-Qaeda insurgents (another instance of implicit Saudi support for militant Wahhabi proxies). However, the Houthis have been steadfast in combating the Sunni insurgents, and there appears to be no indication any sort of drawdown will be happening in the near future. This has drained Saudi defense resources, forcing them to redirect a substantive portion of their military spending and air power at a conflict whose resolution will offer them little more than a return to regional stability once suppressed. Beyond that, there are no grand tactical or political benefits, nothing enormously momentous or positive that can be feasibly carried beyond the theater in Yemen. This represents an ideal investment for Iran in terms of undermining Saudi reach in the Middle East. 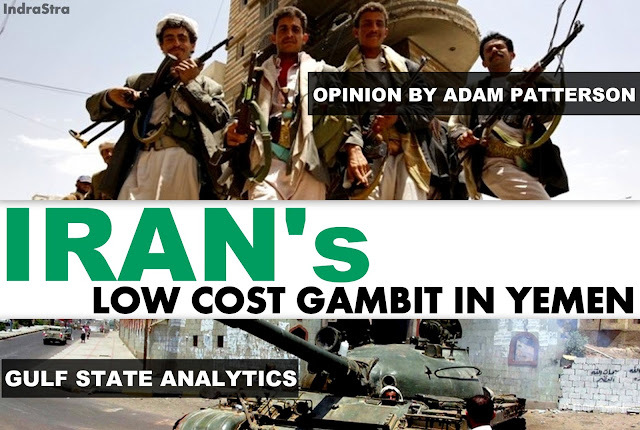 At this juncture, Tehran has very little to lose by exacerbating the Yemeni conflict. Though in no way parallel phenomena, a resolute and defiant Houthi insurgency would also provide counter-pressure against the Saudis to match the Sunni insurgency that is wearing down the Tehran-backed regimes in Syria and Iraq. However, the outlook for the Houthi rebels and their effective alliance with Iran remains unpredictable. Saudi Arabia has made a policy of aggressively closing off flight and maritime space, making it difficult if not outright impossible for Tehran to supply the Houthi rebels. Meanwhile, Iran’s behavior suggests that the ongoing strife in Yemen serves a propaganda purpose. Tehran’s power players are attempting to subvert the longstanding (and arguably dubious) contention that Iran is uniquely disruptive or destabilizing to the Middle East as a whole, and doing so by arguing that Saudi Arabia’s embargoing of aid to Yemen is cruelly indifferent to the plight of the Muslims who live within its borders. As Riyadh and Tehran compete for the hearts and minds of Arabs, building up Saudi Arabia as a callous and self-interested brute could be potentially valuable for Tehran, especially as the kingdom is seen by many in the region as the main backer of Daesh in Iraq and Syria. The Saudi air campaign has had a devastating impact on the people of Yemen. Various estimates place the vast majority of blame for the well over 2,000 civilian casualties in the past six months on the Saudi-led coalition. The kingdom has effectively declared entire cities to be military targets, indiscriminately razing entire neighborhoods. This has only fed into Iran’s ongoing condemnation of the House of Saud, with Tehran leveraging the line that the Saudis are amoral power players with a nihilistic attitude toward the lives of their fellow Muslims. In the midst of this, Saudi Arabia is stuck with both the civilian refugee aftermath of the conflict as well as the consequences of prolonged and heavy military investment. Throughout the summer of 2015, Iran’s actions vis-à-vis Saudi Arabia pivoted toward a withering agitprop, with both Iranian policymakers and media entities conflating Saudi Arabia’s actions with Saddam Hussein’s brutality, as well as persistently broadcasting a reel of harrowing war footage. Given the harsh conditions that many Yemenis face as the Saudi-led coalition continues to bomb the country, it has been easy for Iran to use the conflict as a means of portraying Al Saud as callous. Many of the Saudi airstrikes seem to be executed with the sole intent of industrial sabotage . There was a report of warplanes hitting a water bottling plant in Hajja province which is part of a greater pattern that could harm civilians more resoundingly than military forces. Certain dispatches indicate that Saudi airstrikes have effectively flattened entire neighborhoods. Recent evidence indicates that the diplomatic polarity between Houthi rebels and Hadi loyalists is becoming even more entrenched with Saudi-backed president-in-exile Abdrabbo Mansour Hadi announcing in early October that he was severing all diplomatic ties with Iran. This seems to present a final marker that the separation between the Houthis and Hadi loyalists is definitely drawn along Saudi-Iranian lines. This recent diplomatic termination came on the heels of the Saudis capturing an Iranian fishing vessel destined for Yemen, which turned out to be loaded full with arms intended for the Houthi rebels. This latter pattern is an especially useful tactic for Iran, because a full embargo blocks both humanitarian aid as well as weapons shipments - and a ship seemingly carrying food and medical aid could also be stowing hidden arms stockades. Iran and Saudi Arabia are in no position to immediately curtail the power of the other, but Iran’s gambit in Yemen could portend a greater shift in the soft power of both countries, at least in terms of their association and image. Saudi Arabia has apparently been aggressively hustling for PR experts and general public image consultants in Washington, a sign that this aspect of their diplomatic edge could well be waning. U.S. President George W. Bush famously hailed Iran as an alleged member of the tripartite “Axis of Evil.” Since 2014, Iran has made open business of countering Daesh in both Iraq and Syria by directly assisting both local governments, as well as by supplying and propping up Hezbollah in Lebanon and backing the group in Syria. Hezbollah’s efforts and the more covert actions of the Quds force have been instrumental in fighting Daesh on multiple fronts. If Saudi Arabia’s connections with localized Sunni insurgency are ever revealed as serious and pronounced, their image as reliable diplomatic partners could be tainted while Iran’s is burnished. Adam Patterson (O-3505-2015) is a Washington, DC-based analyst of international security topics, with a special focus on insurgency and conflict in Arab states.